We want your SpareFoot membership to be enjoyable, educational, and profitable for you. This article covers 5 easy ways to ensure that your SpareFoot experience is the best it can be! You probably signed up for SpareFoot to get new customers, and we're more than happy to send them your way! In addition to increasing your occupancy with the customers we send you, just being listed on SpareFoot (which is totally free) is beneficial in and of itself - to your brand and your bottom line. We sometimes hear from storage facility operators that they love how many customers SpareFoot sends them, but at the end of the day they wish these customers would seek them out directly. After all, who wants a middleman between you and your prospective customers? We remind these operators that the exposure they gain from their SpareFoot membership isn't an alternative to customers who would (and still do) seek them out directly. SpareFoot is able to send you customers who wouldn't otherwise come to you directly. These customers find and rent from SpareFoot facilities because they like our "shop around" marketplace. Also, our affiliation with big-brand partners exposes these customers to your facility early in their moving/storage search, and gives them confidence in the quality of SpareFoot facilities. Just like you, SpareFoot helps to move thousands of tenants each year into storage units. Here's what makes the consumers' interaction with our service unique: We're an objective comparison shopping marketplace. Consumers prefer - and tend to trust - that kind of experience. We use a third-party service called TrustPilot that allows the customers who have used our service to review their experience finding storage with us. We show prospective customers these overwhelmingly positive reviews, which gives them peace of mind and confidence in using SpareFoot to find the perfect unit for their needs. Also, SpareFoot has secured exclusive partnerships with trusted organizations like AAA and Penske Truck Rental. When customers find your facility on SpareFoot through one of these partners, the integrity of the partner's brand gets extended to your facility by way of your SpareFoot affiliation. That's a level of trust that money can't buy, and it helps reinforce and strengthen your reputation and credibility - online and offline. By always keeping your SpareFoot account "ON," you can maximize economics at your facility. It doesn't matter if your facility is 45% full or 95% full. SpareFoot's pay-for-performance business model works in your favor to earn you more rent dollars per square foot at your facility. It's rare to have a marketing channel that's completely pay-for-performance. That means SpareFoot invests heavily upfront in attracting storage-seekers and getting them to our website. You only pay for these customers after they move in. Other marketing channels like SEO, pay-per-click advertising and the Yellow Pages require hefty investments from you before a tenant actually signs a lease. With SpareFoot, ROI is always hugely positive. You can confidently increase your revenue occupancy through rent raises and other maneuvers. Know that SpareFoot's reach can fill any vacancies that may arise, all with no upfront cost to you. Those economics are unparalleled. SpareFoot is an occupancy booster, and we're here to get your facility access to customers you wouldn't ordinarily be able to reach. With millions of storage-seekers visiting our site each year, lots of qualified customers are going to see your facility listed on SpareFoot. So, what can you do to catch their eye and turn an online shopper into a new tenant? The answer to this question is actually quite simple - just focus on getting good online reviews, follow up with tenants after they make reservations, and ensure your photos online are high-quality representations of your property. Customers trust reviews from other customers who have rented from you before. Be sure your SpareFoot listing stays fresh with current, accurate reviews of your facility. Call customers after they make a reservation on SpareFoot! Win them over with your customer service and answer any questions they have. This is the easiest way to ensure that the customer who just reserved a unit with you actually shows up to rent. We've got great tips for what to talk about and free tools to make follow-ups a breeze. A picture is worth a thousand tenants! Online shoppers want to know what your property looks like before they pull the trigger and reserve a unit. SpareFoot is designed to be a low-maintenance and easy-to-use tool. That said, it's important to do the necessary audits and housekeeping to be confident that your facility remains best positioned for SpareFoot success. Check the Dashboard area of MySpareFoot to see how your facility is performing. Also, keep track of your reservations to make sure all of your SpareFoot customers that are scheduled to move in have been contacted, and that their reserved unit is ready to rent. You're in complete control of the information about your facility that prospective customers see online. Make sure that changes to your facility operation, like new office hours, get reflected on your SpareFoot page. And of course, make sure the units, prices and promotions that you're listing are completely accurate. SpareFoot, as well as industry experts, share effective strategies to help you move the needle on some of the most important performance metrics. The latest in acquisitions, development and investment. 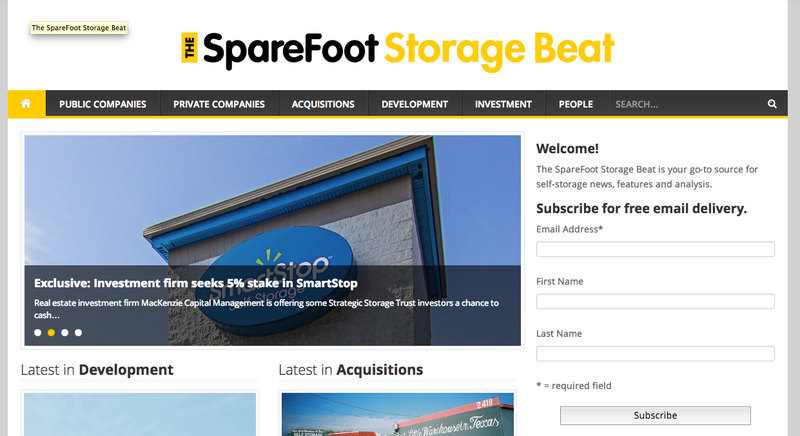 This is your go-to source for news, features and analysis about the self-storage industry. All about life at SpareFoot. We are a fun tech startup disrupting the traditional self-storage industry. This blog covers company news and tales of our life as a startup. Did you already subscribe to those two blogs? If not, please scroll up and do so! SpareFoot works with more than 10,000 storage facilities and interacts with nearly 6 million storage-seeking customers each year. That's a whole lot of people! Through surveys, interviews, and behavioral analysis, we produce and share actionable resources that can help you make tough choices. Want to know the average price of a 10x10 in your area? What about the area of the country where facilities are selling for the most seller-friendly rates? How do the industry's savviest operators think about raising rent? All of these are questions that we've answered, and SpareFoot clients have access to our reports, white papers and case studies for free! Always remember - we're here for you! We love our clients, and we are very appreciative of your business, your trust and your partnership! Our Client Care team is excited to get to know you - if you have a problem, suggestion, or just want to chat about your account, please don't hesitate to reach out. Thank you for using SpareFoot!